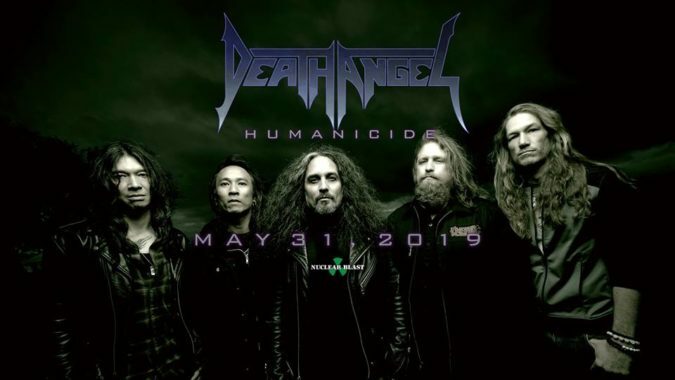 Long-running Bay Area thrash metal royalty DEATH ANGEL announce the worldwide release of their eagerly awaited ninth studio album, ‘Humanicide‘, via Nuclear Blast Records on May 31st. With today’s announcement, the band unveils the album artwork, track-listing, and first new single, the “Humanicide” title track, with a visualizer. The arrival of the new record will be preceded by a U.S. tour that sees DEATH ANGEL, alongside ACT OF DEFIANCE, as both provide direct support to OVERKILL. You will find the touring itinerary shared below the video clip on this page. For ‘Humanicide‘, DEATH ANGEL returned to work once again with friend and producer Jason Suecof (Charred Walls Of The Damned, Trivium, Six Feet Under) at Audiohammer Studios for the recording and mixing, with the legendary Ted Jensen of Sterling Sound handling mastering. After working together on three previous releases, Suecof seemingly has embraced his role as the (symbolic) sixth member of DEATH ANGEL. According to the PR release that accompanied today’s news, DEATH ANGEL continue to revel in their place as one of U.S. metal’s most respected bands. Their refusal to embrace flimsy musical trends, while maintaining their signature style of aggression and galvanized technical edge, has placed DEATH ANGEL at the forefront of the metal underground. At the same time, they assure fans that ‘Humanicide‘ will push the envelope just as they have always done, this time with new elements that include acoustic embellishments, guest musicians, and for the first time ever, piano based moments. Today’s song premiere, “Humanicide”, triumphantly represents the entirety of the album, immediately energizing the listener with its ferocious intensity. ‘Humanicide‘ is adorned with ominous and stunning artwork created by artist Brent Elliott White (Megadeth, Job For A Cowboy, Trivium). It will be released from Nuclear Blast May 31st and is being made available in a variety of formats, with pre-order active now at this LINK.